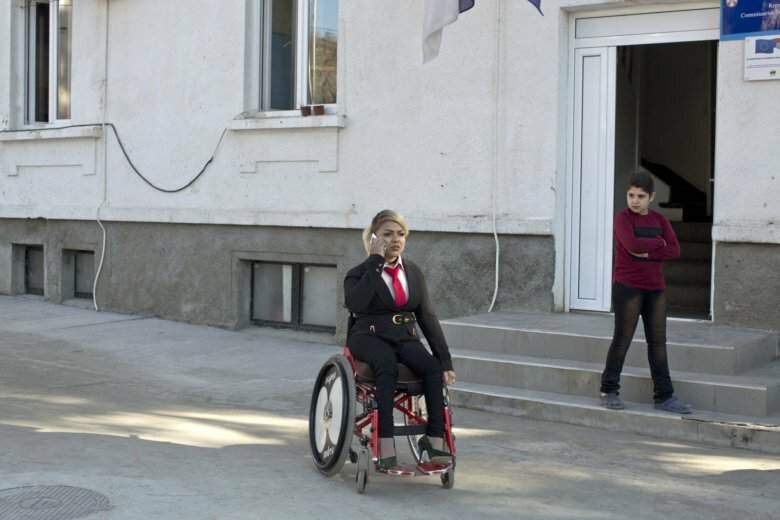 BOSILEGRAD, Serbia (AP) — As a little girl in a wheelchair in Iran, Mahana Jami used to watch children playing on a slide and wonder why she couldn’t do the same. She made a promise to herself — to always dream big and never let her disability stand in the way. Many years later, as a 34-year-old woman, Jami is now pursuing a dream of life in a free country somewhere in the West where her disability is recognized and accommodated — and the chance to scale the world’s tallest towers using only her arms. Jami’s journey started when she left Iran, first to go to Turkey and then to Serbia, in hopes of eventually moving to a democratic and prosperous Western nation where she believes disabled women enjoy more rights and opportunities than in her native country. She has since joined thousands of migrants from the Middle East, Africa or Asia who are stuck in the Balkans as they try to reach the wealthy member states of the European Union. Most migrants are in camps or sleeping in the open throughout the region, with concerns mounting over the situation as the tough Balkan winter approaches. Serbia’s EU neighbors Hungary and Croatia have been turning migrants back — Hungary has erected two rows of barbed-wire fence along its southern border while Croatian police routinely face accusations of violence against migrants, which they have denied. Jami is currently staying in a small, government-run center in Bosilegrad, a remote mountain town in southeastern Serbia, on the border with Bulgaria. Jami’s husband and adopted son are also there. Motivated rather than limited by her disability — her legs were paralyzed by polio — Jami has always been a fighter. She has earned a master’s degree in chemistry; tested her boundaries with swimming and weight-lifting; and broken records by climbing nearly 2,000 steps of Tehran’s landmark Milad Tower in 2013, pulling her body up by her arms. Her decision to try to seek more freedom and opportunities in the West reflects hopes harbored by many migrants who are ready to endure hardship and wait for months, sometimes years, for a chance to fulfil their dreams. Full of hope and anticipation, Jami smiled broadly while showing the visitors her many certificates of excellence from Iran. Carefully made up and elegantly dressed, Jami appealed to world governments and organizations to help her receive the medical care she needs and raise her above the limitations she said Iran has imposed on her. Jami came to Serbia in a surge of arrivals from Iran after the two countries introduced visa-free travel for each other’s citizens last year. Serbia recently abolished the deal under pressure from the EU. Migration remains a source of division within the EU, although the numbers of people moving to the West have dropped dramatically since the mass influx in 2015 when about 1 million migrants entered Europe. Anti-migrant sentiments have been on the rise and countries like Austria and Hungary have announced they will not support next month a U.N.-backed global pact for orderly and safe migration. Jami, though, is undeterred by narrowing options for migrants, and seems certain she will eventually succeed. She speaks with enthusiasm about her plans to conquer seven of the world’s best-known tall buildings, including the Empire State Building in New York and Dubai’s Burj Khalifa. Jami’s eyes filled with tears as she spread out a T-shirt with a drawing on one side depicting her as a girl looking at a children’s slide from a wheelchair and the seven towers on the other.